Extreme low altitude flying in Star Citizen. Exercising high speed low flight over Lyria in Star Citizen alpha PTU 3.5.0. Due to the speed, my ship was constantly triggering the reentry flame effect. Use the code STAR-NKV4-D9RJ on your account creation to get 5,000 free UEC/credits (the in-game currency). Captured my solo journey around Crusader’s distant asteroid fields, while doing the ICC missions chain in the baby PU of Star Citizen alpha. Despite the fact that currently (2.6.3) the playable area is just a ‘small’ region around a gas giant, the distances are VAST. And if you don’t have an active Quantum Drive/fuel in you ship – you are dead (the normal drive’s speeds are too slow for such a great distances). I’ve strangely enjoyed floating only in my pressure suit in the middle of nowhere, millions of kilometers away from the closest station. The emptiness and quiet of space combined with the view always give me chills. At some point I’ve found two destroyed Starfarers (fuel haulers) near Yela’s belt (27:15). Man…the wrecks were dark and scary! And on top of that I couldn’t turn on my flashlight (not sure if bug or the type of armor I wear) which made my experience even more immersive and frightening (in a good way). 3.0 secretly built into 2.6.3? They’ve cut my connection just before I landed on the planet. Illuminati confirmed! Star Citizen | Somebody got into my ship! Friendlies are always welcome to join me in my ship for a trip (with my permission). For the record – I shot two uninvited “guests” after their failure to respond to my questions, but the camera wasn’t on for the first kill. 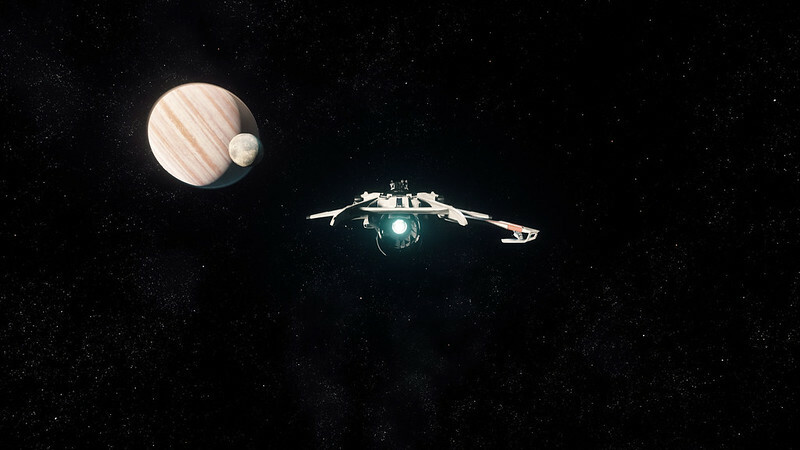 I was in my Starfarer and preparing to take off from Port Olisar’s landing pad when I’ve noticed two unknown players running around in my ship. I asked few times in the General chat who are they, but didn’t get any answer, so I decided to have some fun with them 😈 I took the ship in space just out of the Armistice Zone’s range. Both players were in the pilot’s cabin for my convenience, so I shot first the one sitting in my captains chair with a sniper. The second player didn’t reacted for awhile and I waited him to get up from his station and then shot him with an assault riffle. Unfortunately I was in a Comm’s range so my actions was registered as a crime. After that, I headed to Kareah to clean the blood on my hands. Use the code STAR-NKV4-D9RJ on account creation for 5,000 free credits (UEC – the in-game currency). Lachev Inc. is recruiting. Everyone is welcome, no matter where are you from or what kind of ship you have. It took around 3 “jumps” (or 4) to reach a distance where the quantum drive became inactive in that same direction (alpha gameplay limitation). I decided to record my journey on the way back to Crusader in Stanton star system and here we are. It was little tricky to pick up the right destination on the ships interface, because all dots were packed really close. After I reached Crusader I headed back to Port Olisar and landed on the platform. A close look at the Freelancer space ship in Star Citizen Alpha. My choice for exploration ship goes here so far. The ship has good visibility from the cockpit, beds for the crew, enough cargo space – it can carry a lot of stuff, huge back hatch (can fit big containers) and good weaponry. The size is big enough but not too much, you can park it easy. The turret on the back can turn 360 degrees which is very practical. Just for the record in this video I’m in the Stanton star system and the planet (gas giant) at the background is called Crusader. Looks really HUGE from closer. I spent few weeks in research on a websites like nexusmods to find the best mods out there which will help improve and give a finished look and more variety to the game. Skyrim doesn’t necessarily need mods to be enjoyable game though, but I really love to mess with all games I play and like the feeling of control over that virtual world (in single player or hosted multiplayer environment) that modding gives me. Now mod support is a must for me to keep my interest to a certain game. Wonderful map from The Elder Scrolls universe which shows all (so far known) continents on the planet Nirn. The main continent Tamriel (Skyrim is in the North) is at the center. Akavir (east) – known to have been one of the original homes of the dragons. The Blades were originally from Akavir, where they were known as the Dragonguard. Atmora – frozen continent located far to the north of Tamriel, it was home to a race of men known as Atmorans around the Merethic Era. Aldmeris (south-west) – The Altmer claim that this continent was the birthplace of both elves and mankind. Pyandonea – island-continent located to the far south-west of Tamriel and home to the elusive Maormer. Thras – partially-submerged continent west of Tamriel. Yokuda (west) – dull, rocky, hilly, desert landscape. It is known to be the original home to the Redguards before they rendered it uninhabitable. Testing the Greyhawk UAV in Arma 3. Observing an enemy camp from high altitude and striking out two enemy armored vehicles with AT missiles. There is just no where to hide on the ground from that beast with his thermal imaging and night vision. The Greyhawk could be extremely powerful weapon in the right hands. Good old days of Arma 2 (Combined Operations), heavy modded. I got only few videos from that time. Nothing special, just free roam on a map of Sahrani. Hunting “Mi 24P Hind F” helicopter with “Ka 50 Hokum A” both Russian helis.